Can't tell your 'consensus protocol' from your 'proof of work'? This could be for you. In a not too distant future, everything from our banking, supply chains, law, accountancy, communications services – and even governments – will have been redefined. Dramatically more egalitarian means of raising capital for start-ups will have been implemented. The need for intermediaries such as lawyers, clearing houses and even central banks will be diminished as we move towards a truly peer-to-peer economy enabled by a new technology – blockchain. At least, this is the promise proffered by many blockchain enthusiasts. The reality is likely to be quite different. There are wildly different perspectives on the impact blockchain will have on our economy and society – from it being illegal and needing to be strictly regulated, to promising the creation of the world’s first “true democracy". As a result, there is a lot of discussion about this technology, with new stories in the press nearly every day. These could be about Bitcoin’s price fluctuations, the recent theft of cryptocurrency Ether or the innumerable ways blockchain could affect various industries. So what actually is blockchain? All of this raises key questions about what blockchain is, as well as how we balance the opportunity with the risks and possible unintended consequences. The word blockchain itself no longer has a single specific meaning, having come to cover a broad range of technologies and solutions. At its simplest, a blockchain allows parties to co-create a permanent, unchangeable and transparent record of exchange and processing, without having to rely on a central authority. Where previous generations of digital technology have been about data and information and how to exchange it faster and more securely, blockchain is about the exchange of value and how to make it instant and decentralised. 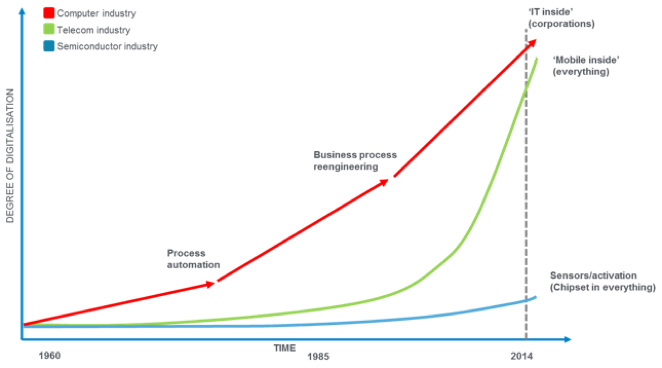 Within this context, many see blockchain as part of the process of digitalisation that has been underway since the 1960s, as shown in the chart below. But while blockchain is undoubtedly part of this process, it is also a dramatic departure from it. Previous technologies were about carrying out the same business processes faster and more efficiently. Blockchain is about completely redefining how business processes are implemented, and even how they are designed in the first place. 1. A consensus protocol, which manages how transactions are recorded and agreed between members. It removes the need to centralize information, say through a silo-ed database, to prove the validity of a transaction. This is probably the biggest breakthrough associated with blockchain, the way it allows parties who don’t trust one another to reach an agreement. It also prevents the problem of “double spend” which, until bitcoin, had been the biggest problem for digital currencies. The double spend problem is when a digital coin or token can be spent more than once because it can be duplicated in a similar way to cutting and pasting in a Word document. Consensus protocols can also prevent fraudulent transactions from being wrongly validated. 2. 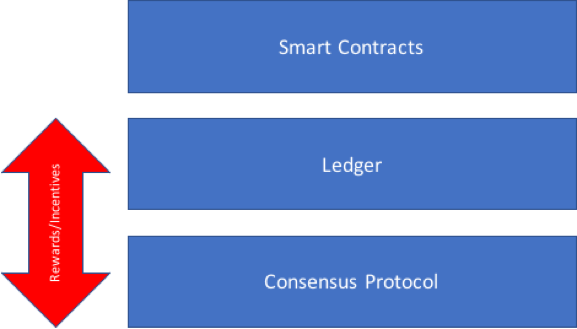 A ledger, which is what many people are referring to when they discuss blockchain. This is a public record of all transactions stored across a distributed peer-to-peer network of servers. Once a transaction is verified, it is added to the ledger as a “block”. 3. Rewards or incentives. A blockchain solution requires either a reward system, such as “miners” earning bitcoin or Ether, or an incentive mechanism to ensure that competing interests are aligned. Within bitcoin and Ethereum, mining is the process of adding transactions performed during a certain time period on to the ledger and is the means by which nodes on the network reach a secure, tamper-resistant consensus. Miners confirm the transactions within blocks through completing complex mathematical problems in order to be able to write them into the ledger. They are paid (or rewarded) in bitcoin. All of the miners compete to be the first to solve the mathematical problem that allows them to write the transactions to the ledger. In bitcoin, this is called “proof of work”. The number of bitcoins miners receive is reducing over time, dependent on how much is left in the network. In total, only 21,000,000 bitcoin will ever exist. Mining therefore provides two functions: firstly to release new bitcoins into the network as miners are paid, and secondly to provide motivation for people to provide security for the system. Even in situations where there's no need to give people a financial reward for mining, there is a strong need for economic incentives, for example finding good reasons for participants in an industry to share data together on the blockchain. The rewards-versus-incentives argument is one of the main ways to differentiate how the economics of a blockchain solution will work. 4. Smart contracts. These are pieces of code that allow applications to be developed on the blockchain. They are secure because, on a blockchain, there is no one single point of failure; the code exists on every node in the network. This means that there is no one place that the code can be manipulated without all the others on the network noticing. 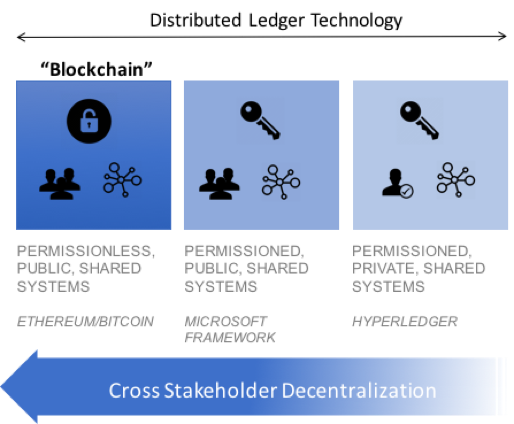 Permission-less ledgers have unique design goals – mainly the need to operate in a completely open environment without any points of centralised trust, and in which potentially malicious actors are not only allowed to submit transactions but also participate in transaction validation. For this reason, in the consensus protocol layer, an extra hurdle is added: a time-consuming and often costly component called "proof of work". The approach is computationally expensive, uses a significant amount of electricity, does not scale well and requires many network participants to be able to generate the trust required to ensure the network operates effectively. These systems need in-depth analysis involving reward models, game theory and behavioural economics. Permissioned ledgers are based on a set of trusted transactions processors and validators who are also the only parties allowed to take part in the consensus mechanism. They are distributed in a precisely controlled fashion and can be equally robust in rejecting un-authorised transactions or changes. This makes corrupting the ledger extremely difficult. More importantly, in comparison to permission-less systems like bitcoin, they require substantially less computational capacity and energy to run. Private distributed ledgers restrict the people who can submit transactions and access blockchain data to an explicit whitelist of identified participants. This is suitable for regulated environments. In the centre of the chart above, we can see a third type of distributed ledger – a form of hybrid system that enables the combination of some of the benefits of permissioned, private, shared systems and others from the permission-less. Blockchain exists at the cross-over between economics and technology. To apply it effectively, we need to understand both sides of its personality. The economics of a system will affect the technical design and vice versa. Its unique properties can provide new opportunities for wider economic and social objectives, but these need to be carefully handled, as the risks are shared by whole economies and societies.